Sure it’s the new year and all but I need to get back in the saddle, so plowing thru we are. I started taking the tree down and packing away decorations. I want to write a post about how I choose decorations and how many you need for a tree. I wanted to do this last year too and even took pics but never wrote the post. For my new job, we can make our own hours essentially. This is awesome. On Sundays, the two other people in charge have church and family time, so Sundays I tend to keep a firm eye on things. Aside from that, I clean up the house, do laundry and try and get in some quilt time. I fond a pattern for some super fast baby quilts and so I worked on those today with the fabrics I got on Friday when our quilt shop had a huge 50% of sale. I also had a gift certificate from my mom, so I used it up too. I’ll put these up in my etsy shop (SIX! BABY! 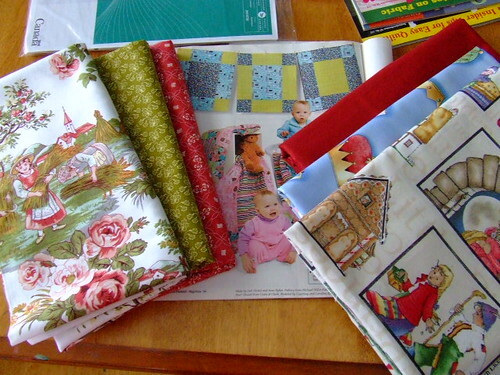 QUILTS!) and if I need a quilt for a baby present, well I have one. We have eggnog to use up. I only bought 1 litre and hardly anyone drank any. I like it but I just cannot drink a huge glass of milk any more. Not if I want my insides to keep on liking me. Eggnog pancakes for dinner tonight. I’m still in my jammies. We try not to get dressed on Sunday unless we really need to go out. How can people let eggnog go bad?! It is liquid amazing. I think I’ve drunk about 5 liters in the last month.